10:30 AM - 4:00 PM 'All That Matter' BAMM Mosaics Exhibition. 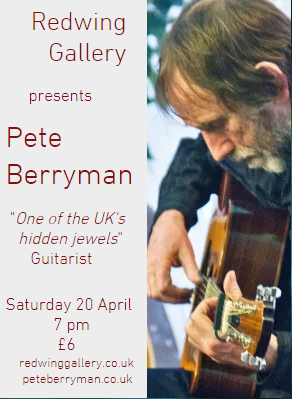 Pete returns to the Redwing with an intimate and relaxed collection of songs and guitar tunes from his inspired journey as a musician. Tickets £6 from redwing Gallery.